While it’s great to interact with others around the world in social networks — to learn what other organizations are doing, and to reap fresh ideas for your own nonprofit — many small nonprofits are community-based with programs and services that are specific to a certain location. What you often need most is to connect with potential volunteers and supporters in your own community. Not surprisingly, Twitter Search is probably the best place to start your search for local Twitter users. Scroll down the Advanced page of Twitter’s own search engine to Places, for the “Near this place” option. Enter your location or postal code, together with a radius in miles, for a live stream of updates from people within that area. You can also do this directly from the regular search box on Twitter, just by entering your search terms in this format: near:place within:##mi — place being your location and ## the number of miles. Tweet Scan User Search helps you find people by the locations they’ve listed in their Twitter bio (as opposed to the location associated with the IP address of the device they’re using to connect to the Internet). Through Tweet Scan, you can also set up an email alert for mentions of your selected keywords — the name of your town or your nonprofit, for example. It’s not unlike Google Alerts, which we’ve talked about before, but this tool is specific to Twitter, identi.ca and other Laconi.ca-based microblogging sites. Nearby Tweets not only lets you search within a set radius of your location, but you can also filter those search results by keyword at the same time — and the drop-down options box makes it quick and easy to change your search terms. This tool is quick and easy, one of my current favorites for doing a local user search around a specific keyword or topic. If you prefer a visual search, Twellowhood offers a clickable map to help you find those people who have identified a certain city as their locations in their Twitter bio. The map is available only for the United States and Canada at present, but the folks at Twellow say they’re working on adding other countries. Although the name sounds promising, and the site lets you promote local events as well as search for local people by location and keyword, Localtweeps is a directory rather than a search tool. Its usefulness depends in large part on how many users register themselves in the directory: as of today, for example, there were 601 Twitter users listed here for New York City. I’m just keeping an eye on this one for now. We’ve talked before about to how to refine a web search using Google’s advanced search operators, and two of those operators are particularly handy for finding local users of social media. Site search (site:) and wildcard (*), used together, can nicely refine your search for Twitter users according to what they’ve posted on their Twitter profile pages — and of course you can adapt this method to search any other social network that has public profile pages for its users. For example, to search Twitter for associations in the Toronto area, you might enter something like this into Google: site:twitter.com “bio* * association” “location Toronto” or use the form on the Advanced Search page to get the same results. 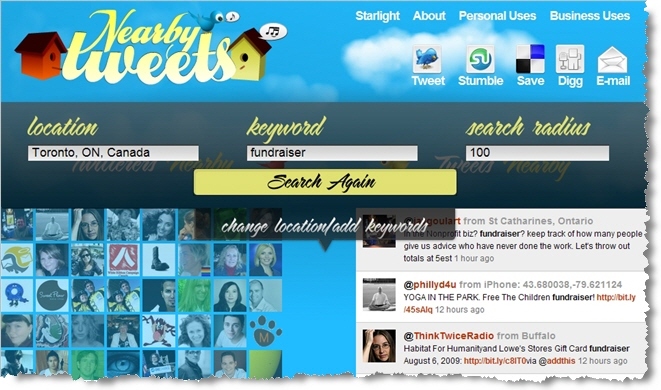 How does your nonprofit find local people on Twitter? Are there any favorite “local search” tools you would add to this list? Then you would love what Tweepz <http://www.tweepz.com> search can do. Using the advanced search options you can search by location name of city OR as it shows OR how it's been enter by the tweeter when they subscribed to twitter, For example: Some people just enter the city name as some others enter only their county as their location when they subscribed.Tweepz will retrieve full profile for each user in a certain location without having to scroll down indefinitly to read all tweets. It's perfect for building a list of tweeters near you. Further more, you can deliberatly build search string by using booleans operator such as "OR" between each entry. For example: <loc:(type_location_here)OR loc:(type_location_here)OR loc:(type_location_here)AND bio:(type_text_here)>.